Around here the wait for Spring Training to start can be excruciating. We scour ESPN.com looking for news to hold us over. But it is January and we end up reading about Rex Ryan and his quest to unseat Bill Belichick as the greatest coach in the land and looking at Superbowl predictions. Fortunately for the fantasy baseball junkie, there is NFL football and the never ending search for yet another sleeper. There has already been plenty of talk about the Tampa Bay Rays making the Matt Garza trade. In case you've been under a rock the deal was Matt Garza, Fernando Perez, and minor league pitcher Zachary Rosscup to the Cubs for pitcher Chris Archer, shortstop Hak-Ju Lee, outfielders Brandon Guyer and Sam Fuld, and catcher Robinson Chirinos. I don't have much to add about Garza himself. I like him in the National League, where he should get a slight boost to his overall numbers. The change in ball parks is not ideal but moving from the AL East to the NL Central should more than make up for it. But you knew all that or at least you've read it on three million different fantasy sites. Far more interesting to me (for fantasy purposes) are the players coming back to the Tampa Bay Rays and the roles we can project for them, especially catcher Robinson Chirinos. After laboring for years to advance as far as Double-A, Chirinos broke out in 2009 by hitting .294/.396/.519 then built on that in 2010 by hitting .326/.416/.583 with 18 homers. At catcher, anything close to those numbers in the majors would make Chirinos a fantasy stud and an MLB star. I think we've been mislead about how important Chirinos was to this deal. The Rangers were also hard after Garza. According to Peter Gammons the Rangers tried to acquire Chirinos for the Rays to include him in a Garza deal. The Rangers were the other team in it to the end. They thought they could get Chirinos from the Cubs, then package him with left-handed pitcher Derek Holland, reliever Frank Francisco and outfielder Engel Beltre, plus pay some of Francisco's contract. Friedman sees everything in the long term, and he thought that in 2012 and '13 -- when Jeremy Hellickson, David Price and Archer could be an extremely formidable front three -- the Rays would have a better chance to keep their window open. The Rangers players plus Chirinos would have been a much better package in the short term as far as keeping their place atop the AL-East. That the Rangers wanted to acquire Chirinos for them indicates how important he was to the deal from the Rays perspective. Fantasy owners should keep a close eye on Chirinos during Spring Training. I believe he has an excellent chance of making the team as a utility player if not as a back-up catcher. He has a reputation as a great glove in the infield and at catcher. The Rays definitely see something in Chirinos and a productive player (even a part-time one) who qualifies at catcher is fantasy gold. That's much more significant to fantasy owners than another rookie pitcher on a team loaded with quality arms. Chris Archer has been discussed a ton as the consensus best prospect in the deal. He was in the top three Cubs prospects by almost every source and for many was number one. He has great stuff and his ceiling is as a front line starter. However, until he improves his control his chances of emerging as more than a quality innings eater are minimal. Though he was at the top of the charts in the Cubs deep system, he is just one of several very good pitching prospects for the Rays. He needs improved control to separate himself from the pack, to his credit his control has improved two straight seasons. He is essentially ready to fill that innings eating role now and could make his major league debut this season. Outfielder Sam Fuld is an ideal fourth outfielder. He is a solid defender at all three outfield positions and at the plate shows patience and the ability to draw walks. He doesn't have much power but can steal bases. He is much like a more durable and experienced Fernando Perez. Stat guys should love Fuld since he is a stat guy at heart as well. He is a Stanford graduate who majored in statistics and interned at Stats, Inc. Our kind of guy. Hak-Ju Lee is a few years away but is a very interesting prospect. Keith Law of ESPN likes him more than most and had him ranked first in the Cubs system. He is a very good defensive shortstop with above average speed on the bases. He doesn't have much power and though some believe he will develop some, power is not likely to be a major fantasy asset of Lee's. Brandon Guyer is an average defensive center fielder with nice speed. He had a very good 2010 season hitting .344/.398/.588 in Double-A with 13 homers, 76 runs, 58 rbi, and 30 stolen bases in 410 plate appearances. He looks like a nice starting option if one of the outfield primaries needs extended time off due to injury. 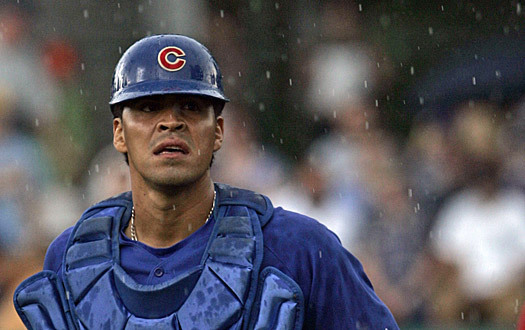 Other Articles on Robinson Chirinos and the Garza Trade that you may enjoy.